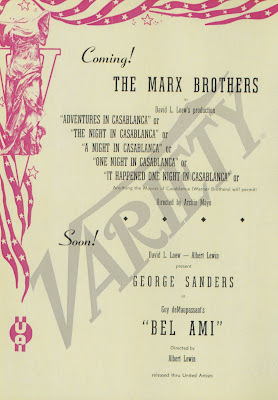 Girlfriend Ann calls A Night In Casablanca best of all the Marx Brothers, her memory of that CBS stay-up event still vivid from age thirteen. I've not forgotten counting down hours to the same broadcast in 1973. Could she care less about such a runt in the Marxes' litter were it not for deep impression made that night? We ran ANIC recently and still it clicks, being for Ann the only Marx that does (she hit the kill button on A Night At The Opera after a first ten minutes). Would outcome have been the other-way-around given Opera instead of Casablanca that long-ago late night? Seeing films first in happy context of growing up is to view same through rose-tinted glass from there on. I suspended critical judgment on the Brothers' Paramount features for knowing them first via afternoon television and 70's theatre revival. When life is good, movies seem better. Many have written of biggest viewing kicks between their tenth and twentieth years. That's near enough to when I experienced A Night In Casablanca first, coming for me as it did on cusp of jaded maturity. To have intersected with it even a year later might have put this one on a pass list from there on. Remarkable the effect a single tube run could have in those days when classic comedy on TV was not to be taken for granted. A Night In Casablanca would be a Marx comeback from so-called retirement. Was the Bros. chucking Hollywood after The Big Store altogether their idea? The latter had been done at reduced cost ($850K) from previous Go West ($1.1 million). Their comedies since A Night At The Opera were money losers. The Big Store realized a minimal profit for getting made cheap, but its domestic rentals came to the team's lowest so far for MGM. Were pink slips issued here, or did the studio propose re-route to lower status for the Marx Brothers? The boys might have hung on in budget comedies like "Whistling" vehicles Red Skelton did, or second features of a sort Laurel and Hardy fell heir to upon arrival at MGM a year or so later. For whatever decline the Marxes experienced, they never sunk to these levels. Further work at Metro might have put them on a bobsled to B's, however. Apprehension of this was as good a reason for quitting as any. David Loew was Casablanca's producer. He was son and heir to founding Marcus Loew of that name's empire at picture-making. David hadn't keys to studio gates, but calls from him were answered, and he'd proven adept so far with independent production (So Ends Our Night, The Moon and Sixpence, some Joe E. Browns). Loew would set up a Night In Casablanca company and, together with the Marxes, share expense and revenue, optimism the greater as this was booming wartime and biz was never better. Preparations got underway a year ahead of the film's release. One boost maybe unexpected was Warner Bros. lodging objection to A Night In Casablanca's title. There'd been several variations on that, as the trade ad below illustrates (and note Loew sarcasm directed at WB "Mayors of Casablanca"). As Groucho might have observed, it was a matter of big bullies picking on little bullies, and he'd not let opportunity pass to spin this controversy in the Brothers' favor. It was serious at first (May 1945). David Loew went to releasing United Artists' legal department in hopes they could arrange arbitration. 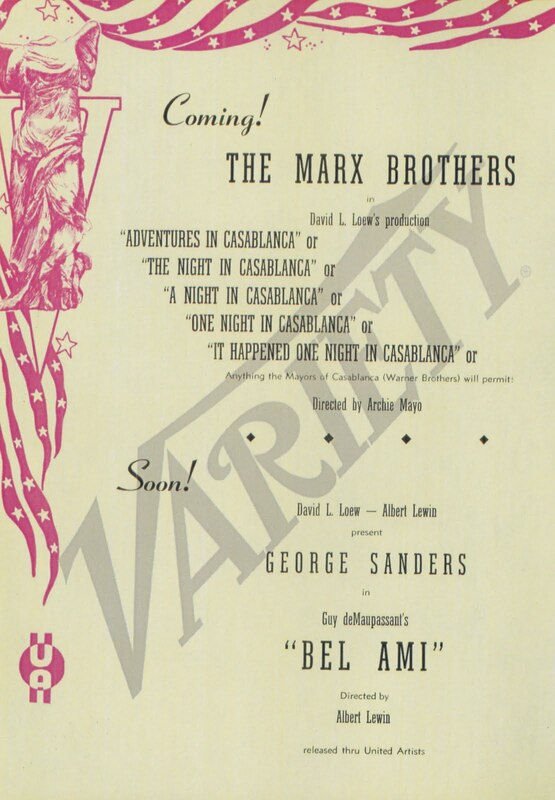 Warners had put forth a flimsy argument that using Casablanca in the Marx film's title would diminish value of their couple-years-old Bogart hit, still playing off in theatres, according to WB. Here was the very sort of major studio arrogance Groucho thrived on challenging. His open letter, published not only in trades but a mainstream press, made sport of Burbank monitors and neutralized what could otherwise have been a drawn out and costly ordeal. Readers meanwhile enjoyed madcap Groucho humbling one of filmland's behemoths, and therein lay valued publicity for A Night In Casablanca. But a question --- had Groucho composed the missive (and for that matter, other letters credited to him), or did gag assist sweeten text for maximum effect? 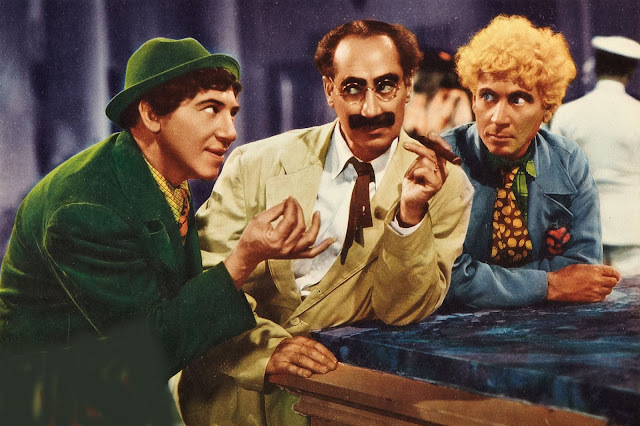 Just wondering ... if his correspondence was so clever and witty as many published collections confirm it was, why didn't Grouch turn some of that brilliance toward improved Marx Bros. movie scripting? The team did apply themselves on A Night In Casablanca, at least starting out. As with prior MGM's, there would be a tour for polishing routines to be used in the new film. The schedule hewed to smaller venues and army bases along the Pacific coast, the "hinterlands" as Variety called it, where hopefully there wouldn't be picture-wise folk to cop any of their ideas (or radio gagsters who might glom laughs for quick ether dissipation). A September 1945 start was planned for A Night In Casablanca, with summer lead-up figured for getting five extended set-pieces ready. Each was timing intensive and only repeat performing could get them in camera-ready shape. Live audience reaction would hopefully tip-off what was funny. It wasn't enough just featuring the Brothers. Their in-person show needed talent to buffer Marx madness and relieve same with song and variety, not unlike formula Metro earlier applied to the team's filmic output. James B. Carson, a rotund, often-mustachioed character comedian (according to multiple Google sources), had long trod burlesque and vaude boards. Was he an old friend to one or more of the Marxes? Also there was John Sheehan, Stanley Price, and a line of girls with the troupe. Sheehan I could find nothing on ... there was a Stanley Price in many westerns, serials, and some short comedies from the twenties into the fifties. Obscure names, but they toured a summer with the Marx Brothers and presumably would have their stories to tell, had anyone asked. There were sixty or so performances, each about an hour long. Routines for A Night In Casablanca were pared, pruned, and polished, said Variety. Producer Loew and Casablanca's director Archie Mayo followed the troupe and singled out props they could retain for shooting later. This sort of preparation reflected Marxian hopes that Casablanca would finesse their screen comeback. Even Groucho was optimistic, according to private letters. Archie Mayo later figured eight days trimmed off sound stage time as result of word-perfect honing of complex scenes, citing a Chico-Harpo exchange of about three minutes that ordinarily would have needed a day to complete. Thanks to prepping on the tour, it wrapped within an hour, according to the director. But Groucho ended up bitter toward his Night In Casablanca director, calling Archie Mayo a "fat idiot" in post-pic correspondence. Letters Groucho penned, so many of which saw later publication, have lots to do with a frankly harsh image attached to him. We assume he didn't write these for other than recipients to read, and there's at least value in having them for unvarnished insight as to Groucho's attitude toward work and those who collaborated with him, but he does come across callous at the least. How many entertainment figures had so much of their private writings revealed? 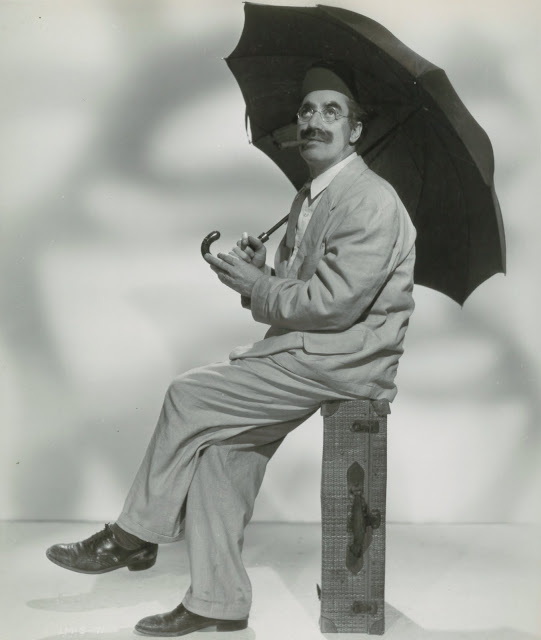 Thanks to accumulation of Groucho's, we have warts and all to reflect upon from most of comedies he made, particularly later ones that proved so unsatisfactory for him. 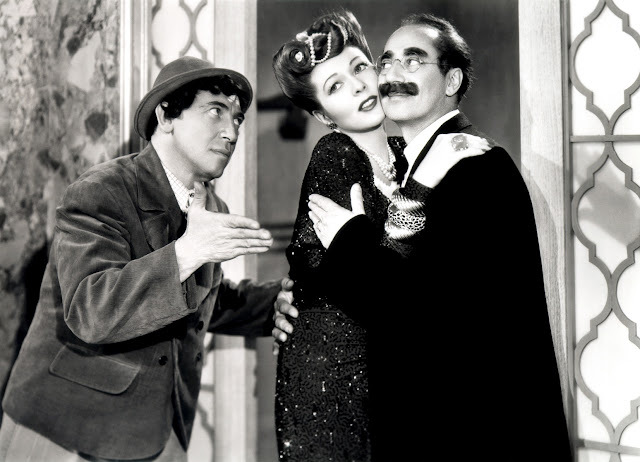 A Night In Casablanca's big slapstick finale is no highlight, and filming it settled Groucho's resolve to get out of Marx Bros. movies and stay out (other than what amounted to an extended cameo in Love Happy). I don't ascribe to notions the team was "too old" for a 1946 try. It's only the extreme physical stuff that gives pause. Last reel blowouts had been a Marx staple for too long. Their best comedy was never these in any case. What plays well in A Night In Casablanca is verbal and close-quarter mirth to show off timing precision the three hadn't lost. There's a reel given mostly to heavy Sig Rumann trying to pack while unseen Marxes unpack, as pleasing to my estimation as 30's routines more celebrated. An uncredited Frank Tashlin was aboard to supply gags --- was Harpo holding up the wall FT's creation? Casablanca's not so corseted as their MGM vehicles (Marx clowning reflects more enthusiasm), and I'm not surprised a 1946 public went for it. Netflix HD is streaming A Night In Casablanca, so we at least have visual quality approaching what first-run viewers saw, if not a show recognized among the team's best. That first post-war year saw stars welcomed back not unlike carpets unfurled for those doing first talkies back in the late 20's. 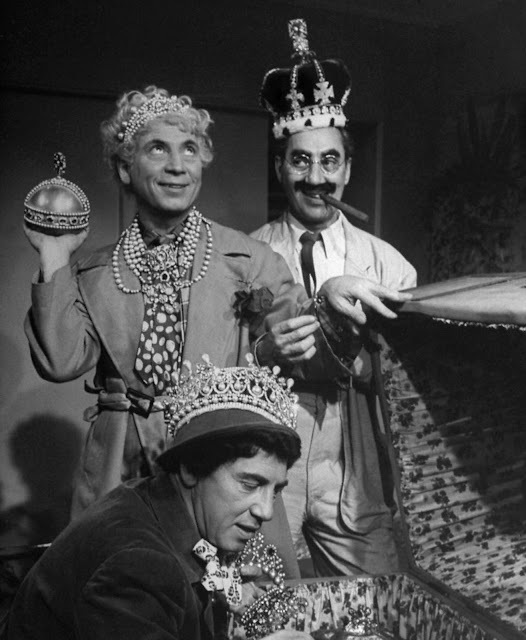 The Marx Brothers hadn't worked for five years and maybe we'd missed them, however tired their act had gotten before the conflict. A Night In Casablanca world premiered to triumph at Chicago's Oriental Theatre, luring a biggest crowd since Amos n' Andy played there long before. 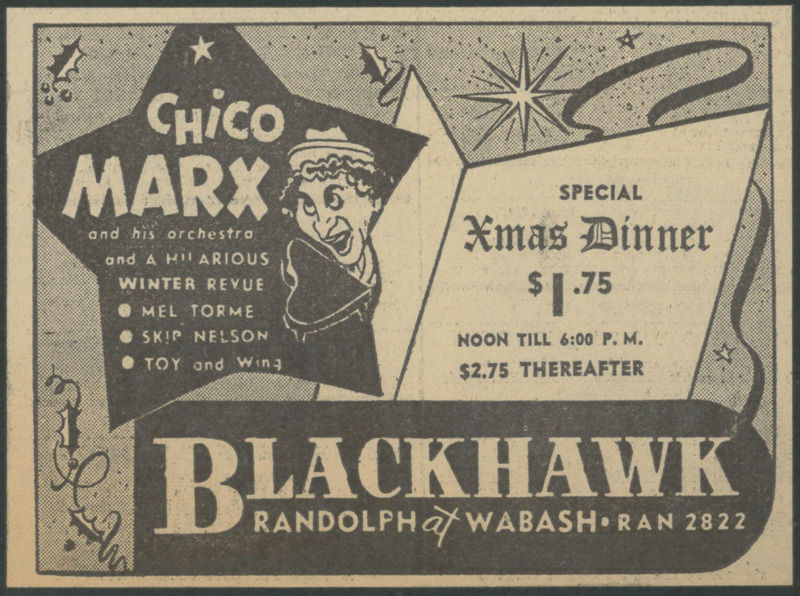 Chuck Foster's Orchestra and singer Bob Eberly fronted the stage revue (there is an Eberly Tender Love Songs collection available on CD), and 55G's were counted for a first week (only Sinatra live at competing Chicago Theatre did better). A Night In Casablanca went on to collect $2.7 million in world rentals, the biggest return of all Marx Brothers comedies. Distribution by Standard Television beginning in March 1956 put Casablanca in an obscure package with other David Loew properties (and coincidentally, Love Happy). 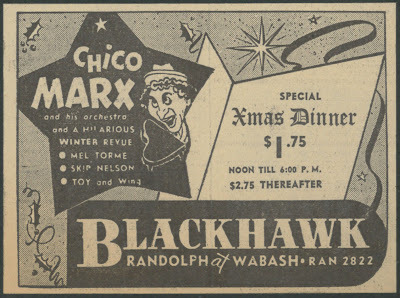 College and revival bookings often paired A Night In Casablanca with Love Happy, the two filling dates for Marx fans who'd long since committed to memory the team's Paramount and MGM pics. That CBS airing was when I first saw this pic, too (only I was 17). I thought it was funnier than it was given credit for by latter-day critics; just the idea of the Marx Bros. on network TV upped the excitement. 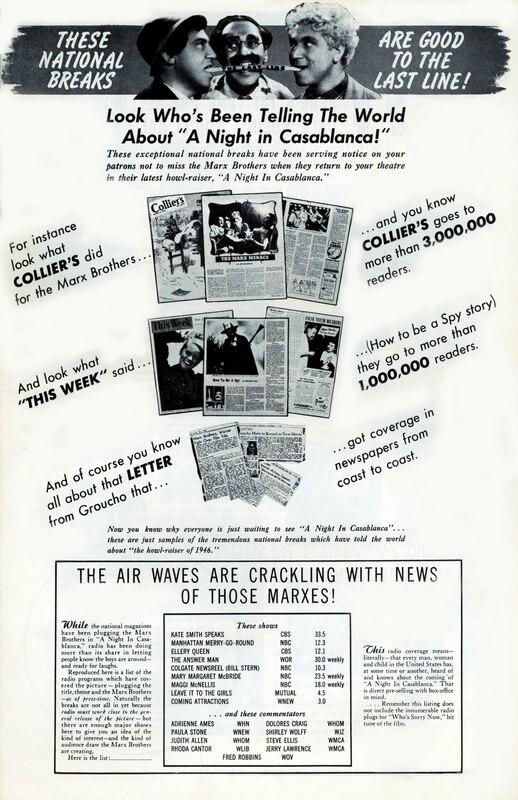 I've read that Groucho's letters regarding the alleged controversy over the title was actually a publicity stunt; that Warners, in fact, didn't threaten any kind of lawsuit (which they must have known wouldn't have gone anywhere). And once again, that "Variety"-speak -- "might glom laughs for quick ether dissipation" -- only proves that its writers were showbiz equivalents of the Navajo windtalkers during World War II. How well I remember the 1973 airing of NIGHT IN CASABLANCA! I had, in fact, just seen the film for the first time at a University screening a few weeks earlier. Holding down my first post-college job in the wilderness of Northern Wisconsin, I risked everything to play hooky, hitchhiking about 180 miles west to meet my girlfriend (future wife, and even bigger Marx buff than yours truly) to catch that Thursday night show. The house was packed and the college kids laughed as if this was OPERA, RACES and DUCK SOUP rolled into one. We all agreed after wards this hard-to-find gem HAD to be one of their best. This Marx CASABLANCA was a night to remember! Less than a month later the thing pops up on TV, network no less, making my big trek seem a little foolish... especially when, in that coldly objective late hour, the film played as barely okay. Time puts things in perspective. I WAS over twenty (just) but I was also a newly minted graduate, crazy in love and that first experience with NIGHT IN CASABLANCA, seeing it with a wildly appreciative audience, was a pretty big deal. I now treasure the memory. Curious, John, that you lump DAY AT THE RACES in with the Boys' money losers. I had always heard that was their biggest hit. I did catch up with most of the Marx canon last year, including the six or seven I hadn't seen in decades. Thought NIGHT IN CASABLANCA, the last three Metros and even LOVE HAPPY all held up better than I remembered! Groucho was pretty rough on this bunch, but every one is stellar compared to any of his solo gigs from the late forties (just finished COPACABANA for the first time the other night. Barely!) Now, to face ROOM SERVICE again! I am a devout Marxist -- and find a great deal to savor in their Casablanca outing. No, it's not Horse Feathers, but it is still funny. GREAT POST! I always regarded "Casablanca" as merely an OK film, far better than "Room Service" (which felt kind of sad with the brothers cavorting in a single set with restroom acoustics most of the time) but weighed down by the soft studio "feel" that set in after the war. There's something about the imperfect sound, limited underscoring, harsh exterior lighting and imperfect editing of 30's films that somehow better suited the Marxes, L&H, W.C. Fields and other sound comics (Only Bob Hope really felt at home in the increasingly suburbanized films). I'll bet the last reel slapstick "blowouts" in the later flicks may not have played well to audiences either...when I was a kid I remember liking the silly chase ending to "The Big Store"; but when I saw it in a theater years later, it was so obvious that the Bros. had been replaced by stuntmen that it really took me right out of the movie. I'm sure the audiences back then were able to notice the difference as well. I greatly enjoyed the "Night in Casablanca" essay. I wish I could remember when I first saw it, but I know it wasn't that 1973 broadcast. I didn't discover the Marxes until the spring of '74 when my high school ran "Horse Feathers" as a fund-raiser. I do recall staying up VERY late to watch "Go West" and "At the Circus" on the local CBS station in the mid-seventies. They would air at around 1 am after the 11:30pm movie. Funny thing: both times the 11:30 movie was the 1967 teen musical "C'mon, Let's Live a Little," and I'd tune in just in time to hear Jackie DeShannon sing "For Granted," which I thought was a cool song. I've never seen that film released anywhere. SHEEHAN: What about you gentlemen? HARRY (indicating himself and his brothers): Three zombies. SHEEHAN: I can see that, but what'll you have to drink? And thanks for the info, Scott! First off, to correct one writer, Harpo did not wear a wig. He actually had his own hair dyed and had it curled. I thought it looked great. We played Night with Love Happy as a double feature at the La Paloma Theatre in Encinitas back in the late 70s. The audience laughed loudest at Groucho's haranguing of the Smythe couple at the Hotel counter. It made our audience laugh loud and long. We also were the first theatre to screen Animal Crackers in San Diego. We had capacity crowds for all the Marx Comedies. “A Night in Casablanca, and also “Animal Crackers” in 1973 and 1979. 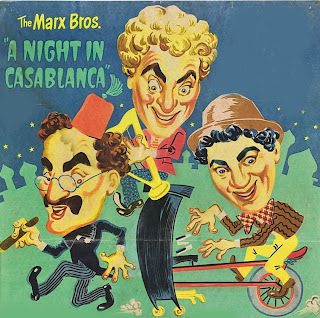 William, I love these telecast records for the Marx Bros. and am delighted to finally have the actual date that "A Night In Casablanca" played on CBS. Thanks a lot for great info! Don't recall Night in Casablanca on the network but do remember watching the Animal Crackers premiere after watching the Paramounts religiously when they showed up on WNEW or WSBK on my local cable service. I remember reading a story re: the 1946 film that the producers had offered Harpo some huge bonus if he would utter the word "Murder!" during the picture. Was this negotiation part of the hype (would Harpo Speak or not?) or did historians (or Harpo) tell the story after the fact? Great post as usual, John. Thanks! I too was watching that CBS Late Movie broadcast of A NIGHT IN CASABLANCA back in 1973. I had only recently discovered "old movies" and was trying especially to see all vintage comedies and comedy teams. 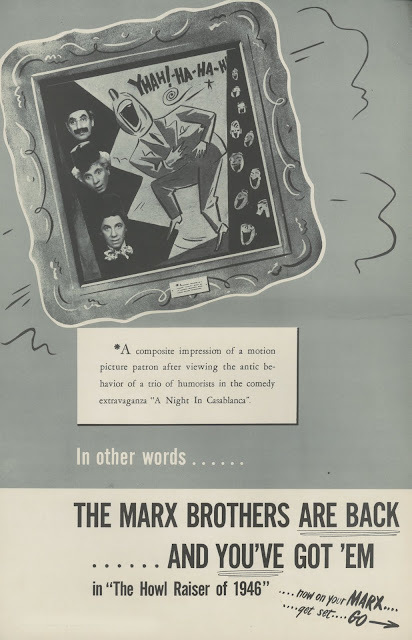 I'd seen a few Marx Bros. movies by then and was thrilled to see A NIGHT IN CASABLANCA was scheduled. Until! - I saw that overlapping on the same night local channel 4 was showing MONKEY BUSINESS! What to do?? I hadn't seen either before by that time. I had also begun audio-taping certain comedies and musicals from TV and had recorded all the Marx features that I could so far. How could I record both that night? I wound up switching back & forth and managing to get at least all the musical and some other highlights taped. In the next few years I eventually would manage get both movies complete. I also rate A NIGHT IN CASABLANCA highly and each time I see it I'm still reminded of that CBS viewing. Without intending it be so, it happens to be my least-watched Marx Brothers movie over all these years. So it's something special when I see it. It's nice now & then to see one for which I don't have every line and note of music memorized. A lovely appreciation of the film, John (but I expect no less from you.) I've forwarded this to Bill Marx, who recently started a website devoted to his dad Harpo and the family, which some marvelous pictures. One thing I've noticed about CASABLANCA is the oddness of several transitions. There'll be dissolves in the middle of dialogue exchanges. Likewise, the Groucho-Chico exchange at the beginning seems a bit truncated. Dayum, I wish they would've found a place in there for Margaret Dumont! I remember this from a TV broadcast a LON-N-N-G time ago-- back when Harpo was still appearing on TV, so it'd be in the late 50s or early 60s. Come to think of it, it probably was the first time I saw the guy from You Bet Your Life with his brothers in a movie. Ted, I really liked the Harpo site. Thanks for the link. As I'm not on Facebook, I couldn't get in to see the posters you mentioned. Sometimes it seems I'm the only person left alive who doesn't have a Facebook page. As to "Casablanca's" odd transitions, it seems I read somewhere that the film initially came in a lot longer and there were cuts made to tighten things up. Ted, this is really an interesting article ... much I didn't know here --- and your posters are especially good. They look very much like one-sheets United Artists would have generated had the movie been made. Everyone should check out Ted's link. We recently ran Night In Casablanca at my home theatre and everyone loved the many sharp Groucho one-liners, the Noir photography, more use of Harpo's talents and the postwar Nazi villian so WELL played by Sig Rumann, who also played off Groucho and Harpo quite well. Dan Seymour, a Casablanca alumnus, also had a great line as Prefect of Police speaking a parody of Claude Rains' "Round up the usual suspects" line. There is much to enjoy in this tightly made comedy--a breath of fresh air after so many stilted and overpolished MGM entries. I'd read that it was Harpo's own hair rather than a wig... Yet in every photo I've seen of the offscreen Harpo, his hair looked too thin to get curled like that. To me, it looked like they were either going for a more realistic look, or they just lost his classic wig. Thanks for the compliment, John. I try. When you watch Dan Seymour's lips rather than listen to the line, it's clear that he actually does quote Claude Rains' line, "Round up the usual suspects," instead of the dubbed-over version, "Round up all likely suspects." I guess Warner Bros. won that round. It is my understanding, altho I could be wrong about this, that part of the Marxes deal with Irving Thalberg was that they got a piece of the action on their first-two Metro pix, and it was under those same Thalberg-set conditions they decided to return to the studio. My father used to tell a great story I never tired of hearing: One afternoon,around 1936 or 37, he and my grandfather were getting on an elevator inside in a medical building in Beverly Hills. As the door is closing, little man, his felt hat pulled halfway down, covering-up his face, gets in. Glances over at my grandfather. "Hi, Moe", he says. "Hello, Leo, how are ya?" my grandfather responds. Dad said he stared at the man, who looked very familiar but he couldn't place him. They get out and each say a brief goodbye. Intrigued by their obvious acquantance, Dad asks, "Who was that?" My grandfather laughs, "Didn't you recognize him -- that's one of your favorite comedians in the movies -- Chico Marx!" This Marx film is important because it's the first one I owned. We got a VCR for Christmas in 1985, a few weeks later, a friend of my father's taped ANIC for us off the Disney Channel(we didn't get that network). Before then, I'd only seen the last 20 minutes of the film once, in 1978. I was 15 and probably watched it 5 times in the first month we owned it. Not to mention the times I fast-forwared to my favorite scenes. I recently watched it for the first time in 20 years, still pretty funny. In his book about Groucho and "You Bet Your Life", AS LONG AS THEY'RE LAUGHING!, author Robert Dwan (who was the sole director for the entire YBYL run, radio & TV) writes that making ANIC made Groucho realize he wanted nothing more to do with the movie business. "He often recounted the moment of truth. It came at one o'clock in the morning at the desperate end of a day's shooting on a cavernous sound stage at the General Service Studios in Hollywood. Hanging upside-down by his knees from a ladder extending from a fake airplane, being blasted by a wind machine simulating a 100-mile-an-hour airstream, Groucho thought 'This is no way for a man my age to make a living'"
I wonder if Julius Marx simply thought that The Marx Brothers were all used up. By the time they’d made A Night in Casablanca, they’d been performing as their basic characters for almost 30 years. Even the costuming revealed this, Groucho the adelpaited academic in cutaway coat and striped trousers, Chico the Italian immigrant just off the boat, in a short peasant jacket and “Pinnochio” hat, and Harpo, the fool, in a battered top hat and flowing blouse. Nothing had changed very much since their uncle, Albert Schonberg, the “Al Shean” of Gallagher and Shean, had conceived their characters, except that Groucho’s grease paint mustache had become a sort of pelt under his nose. Everybody loved the Marx Brothers, just as everybody loved Charlie, with his derby hat, cane, and the battered elegance of a turn of the century gent. By now, though, the popular comedians were like Bob Hope and Abbott and Costello, right off the radio with their patter and wise cracks, though maybe with a little slapstick thrown in. Julius was on the radio, too, and considering the possibilities of a new medium, television. There might still be things to do in the movies, but not as an endless reiteration of something whose time had passed. He didn’t want the Marx Brothers to go the way of Laurel and Hardy, or at any, not with him in it. The only reason they got together for this film and their last one as a tean, Love Happy, was because Chico was hard up for cash after paying off the bookies. 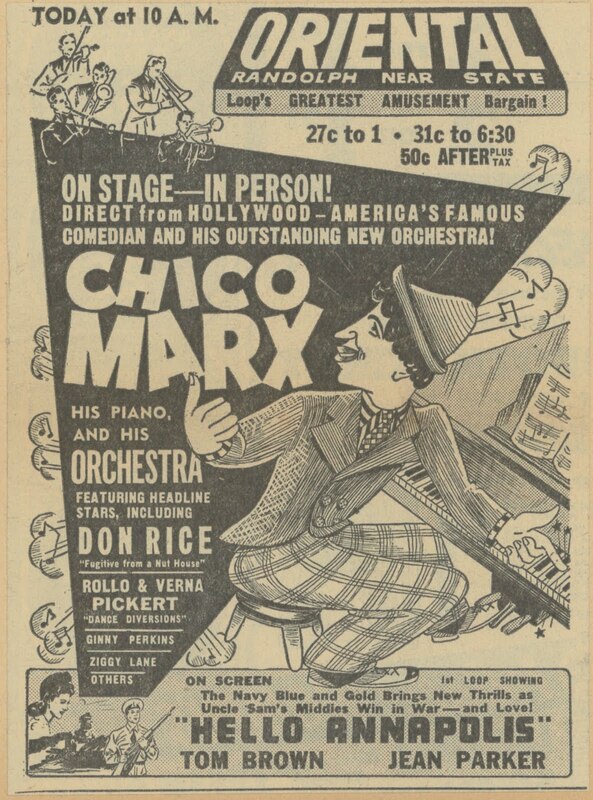 No, if Chico needed the dough, he could front the Chico Marx Orchestra. Julius was going on to better things. P.S. My Grandmother Mercer died of a heart attack watching “You Bet Your Life.” I have no idea whether she was laughing at the time, but ever after, I found that duck with the mustache unbearably creepy and the show much too sinister to watch.